Relax and step away from everyday life stress! Coloring books aren’t just for kids anymore. Nowadays our lives become busier and more complicated. Technology escalation moves us through waves of emails and social networks’ notifications. This constant stimulation of expectations, obligations and stress has left us burnt out and distanced from the joys of the present. Finding a moment of calm can be a challenge. Recently, coloring has been discovered a wonderful activity for anyone who wants to relax, de-stress and release mind from overwhelming thoughts. The growing popularity of adult coloring books proves its positive simplicity and being a trendy way to find yourself focused and unwind from the hectic pace of modern life! Channel stress and anxiety into artistic fulfillment. Escape to the world of inspiration suitable for both, beginners and advanced colorists, anyone who loves coloring joy. There are no instructions, no rights or wrongs, and there is no need for expensive art supplies. Color in any way you wish to create unique and exquisite pieces. Coloring can benefit those who find it difficult to discover their inner artist when faced with a blank page. Switch off and lose yourself in the flow of coloring. Filled with fanciful mix of devious forms, the book features detailed florals, mandalas, sweeping swirls, flowing lines, geometric and abstracts prints. This book ensures hours of entertaining mental relaxation. Take your time, bring the color and let your imagination run free! These amazing, intricate arts are ready for you to add your own special touch. 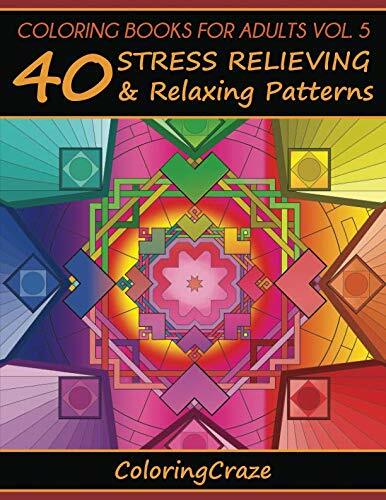 40 beautiful, stress-relieving patterns, designed to engage and spark imagination to unleash your inner creativity. Different levels of detail, from easy to difficult (for different eyes). Pick a picture depending on your mood and start your de-stressing journey. Printed on large 8.5×11 high quality paper. You’ll have plenty of space to be creative and work on the details. Each drawing is printed with the reverse side blank. When you are done, you will have unique piece of art, worth framing and displaying. Perfect for decorating with colored pencils, gel pens, markers, porous point pens or crayons. Share your coloring passion. Give your friend a gift of relaxation or sit and enjoy it together. You don’t need creative experience. If you find it difficult to discover your inner artist – you will still benefit. Coloring alone is calming, just add color! Scroll up and get it now! *Please note that if you are using markers or gel pens, consider using scrap paper behind the page you’re coloring to prevent bleed-through.